Our adhesive coat hooks with contemporary four peg design offers an aesthetically pleasing and fantastic practical solution for holding multiple belongings during cubicle occupancy. For a secure, long-lasting grip, firmly position the self-adhesive pad onto a flat surface, ensuring that the backplate appears straight and in line with the door or partition edge. The 4 hook coat rack is manufactured from corrosion resistant grade 304 stainless steel with a highly reflective finish, appearing stylish in all cubicle facilities. 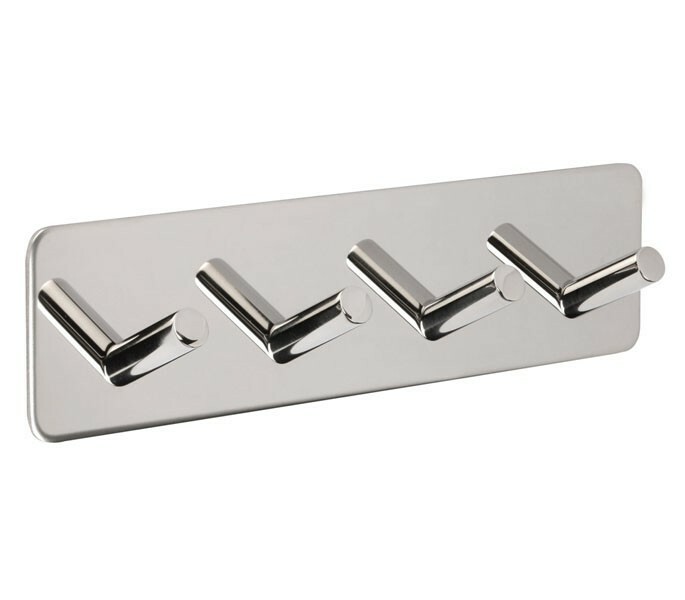 The adhesive coat hooks with four peg design includes a backplate measuring 180mm in length and 47mm in width with a 30mm projection for all four coat pegs.